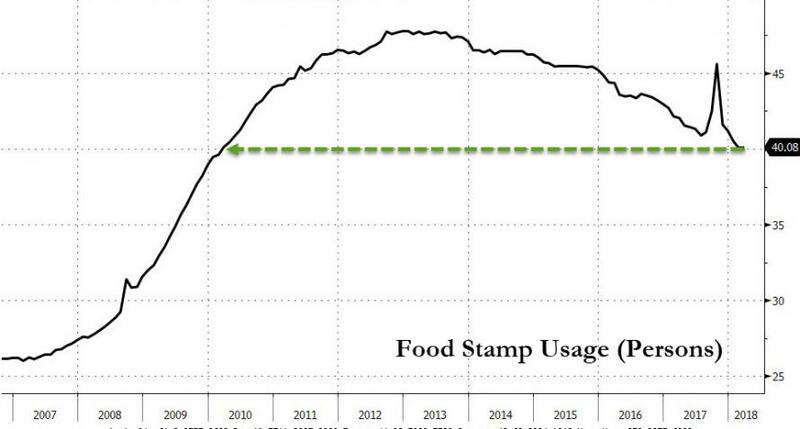 Food Stamp usage in America has fallen 7.8% since President Trump's election - the fastest such drop in Americans' dependence on the state for sustenance ever. Even better news, at 40.08 million people, this is the fewest Americans to rely on government food handouts since February 2010. 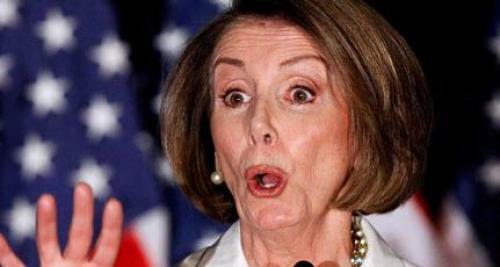 Of course, we are sure this will be viewed as terrible news by the left - most especially Nancy Pelosi. 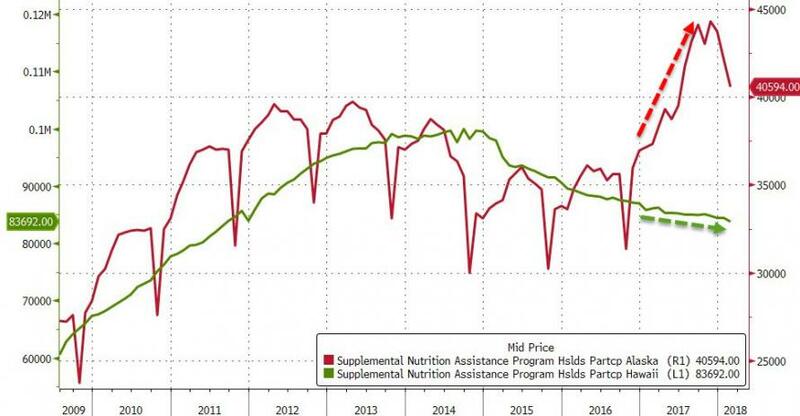 Of course, this dramatic decline in food stamp usage comes as the Trump administration pushes changes to the program, which as Dan Calabrese recently noted, are genius since - much to the chagrin of the left - you're not supposed to like being on welfare!! If I was on food stamps, I wouldn't like this either... I think that's the point. If you can't afford to buy your own food and you need the government to provide it for you, then you get it on the government's terms. That's usually what happens when someone else is supplying your needs. Don't like it? Take every available action to get off food stamps and achieve independence, at which point you can buy whatever you want at the grocery store with your own money that you earned. Under the USDA America’s Harvest Box proposal, all Supplemental Nutrition Assistance Program (SNAP) participating households receiving $90 per month or more in benefits will receive a package of nutritious, 100-percent U.S. grown and produced food. Approximately 16.4 million households, or about 81 percent of SNAP households would be impacted by this proposal. USDA would utilize a model similar to that currently used to distribute USDA Foods to other nutrition assistance programs to provide staple, shelf-stable foods (such as shelf-stable milk, juice, grains, ready-eatcereals, pasta, peanut butter, beans, canned meat, poultry or fish, and canned fruits and vegetables) to SNAP households at approximately half the retail cost. This proposal creates a new approach to nutrition assistance that combines retail-based SNAP benefits with delivery of USDA America’s Harvest Boxes supporting the President’s leadership on Buy American. This proposal is cost-effective, enhances the integrity of SNAP, and provides for states’ flexibility in administration of the program. The remainder of the household’s benefits will still be provided via the current Electronic Benefit Transfer card. The Department of Agriculture estimates the change would save taxpayers $129 billion over 10 years by switching to defined packages that would presumably have a predictable, consistent cost. I'm guessing it would actually save a lot more than that precisely because people would hate being restricted to the Harvest Boxes, and at least a significant percentage of them would respond to the added incentive to improve their situations. And of course, I'm sure part of the idea here is that people can't trade or sell their food stamps or find some clever way to use them to get booze, cigarettes, drugs, etc. Yes, the government would be picking out your food for you. Yes, that would be frustrating and no fun. The point of food stamps is not to treat you to gourmet meals. It's to prevent you from starving to death while you get out of the trouble you've gotten yourself in, whether that takes the form of unemployment, underemployment or some other type of financial mess. We want you to have food. We want you to live. But if you want the kind of food you prefer, that's going to require you to earn your own money and buy it. That is not an unreasonable proposition. You're not supposed to like dependence on the government. You're supposed to want to get off it as quickly as you can. If you get stuck with the Harvest Box and you still don't make the changes necessary to improve your life, well . . . at least you're saving the rest of us some money. But this is undoubtedly great news as James Bovard, op-ed via The Hill, recently explained that food stamps are a perpetual bailout for the junk food industry. The Trump administration is pushing radical changes in the food stamp program as part of the farm bill. Reform efforts may be derailed by activists who vastly exaggerate hunger and portray food handouts as the epitome of social justice. But federal food handouts have already done far too much damage to Americans’ health. Food stamps are now feeding 42 million people. Twitter activists created a #HandsOffSNAP hashtag to seek to block any efforts at reform. But, while politicians portray food stamps as a nutrition program (Congress changed the name to Supplemental Nutritional Assistance Program, or SNAP, in 2008), they are actually a blank check to buy more calories. Food stamps have long been a dietary disaster. Walter Willett, chair of Harvard University’s Department of Nutrition, observed, "We've analyzed what (food stamp) participants are eating and it's horrible food. It's a diet designed to produce obesity and diabetes." A 2017 public health study found that food stamp recipients were twice as likely to be obese as eligible non-recipients. Similarly, a 2015 USDA report revealed that food stamp recipients are more likely to be obese than eligible non-recipients (40 percent vs. 32 percent). Food stamps are a perpetual bailout for the junk food industry. A 2016 USDA report revealed that soft drinks are the most common commodity purchased in food stamp households. Together, "sweetened beverages, desserts, salty snacks, candy and sugar" account for 20 percent of food stamp expenditures. Food stamp recipients consume twice as many of their daily calories from sugar-sweetened beverages as do higher incomes groups (12 percent vs. 6 percent), according to a 2015 study in Preventive Medicine. A federal program designed simply to boost calorie consumption makes no sense at a time when obesity is rampant. 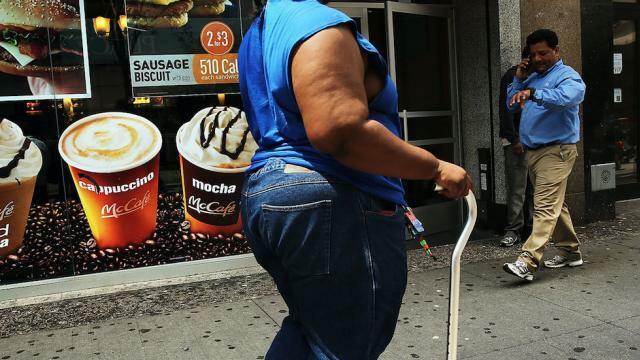 Forty-four percent of low-income women are obese; the rate is even higher for black (56 percent) and Hispanic (49 percent). Food stamps are justified to prevent hunger but the federal government does not even attempt to collect data on how many Americans actually go hungry. The National Academy of Sciences urged USDA to create a hunger gauge in 2006 but the agency has done nothing on that score. Instead, USDA conducts annual surveys measuring a vaporous notion of “food security” — which can simply mean uncertainty about being able to afford groceries in the future or not being able to afford the organic food one prefers. Though USDA stresses that the survey is not a measure of hunger, its results (and those of similar surveys) are perennially twisted to maximize teeth-gnashing. According to the Share Our Strength No Hungry Kids’ campaign, “1 in 6 kids in the U.S. face hunger.” According to the National Coalition for the Homeless, “one in five children go to bed and awaken hungry.” A sparsely-responded food security survey released last month by Temple University sociologist Sara Goldrick-Rah implied that 36 percent of college students were suffering from hunger (the report is titled “Still Hungry and Homeless in College”). The tactic helped spur ludicrous headlines claiming her report showed “starvation" among students. After equating food insecurity with hunger, handout advocates acknowledge that food insecurity is connected to weight gain. Throughout most of human history, hungry people were portrayed as gaunt, if not emaciated. But nowadays, a profusion of XXL shirt sizes is apparently proof that more free food is needed more than ever before. Blaming obesity on hunger or food insecurity is a way for these advocates to absolve millions of overweight people for every Big Gulp Pepsi they ever drank. 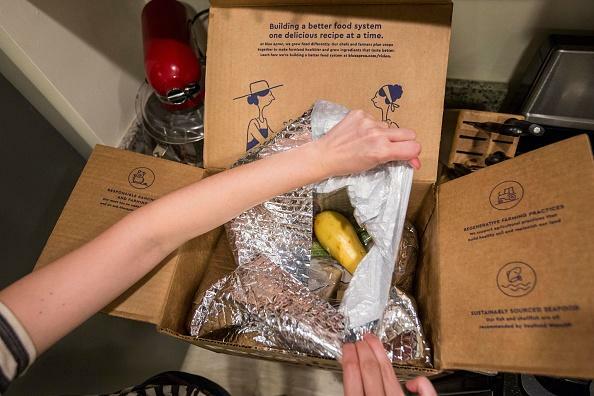 The Trump administration proposes replacing much of the food stamp program with boxes of government-issued food. Though a similar program helped protect people against severe hunger prior to the creation of food stamps, switching to food distribution at this point would likely be confusing, if not counterproductive. It would be far more effective to reform food stamps based on the Womens Infant Children program, which provides coupons only for specific relatively healthy foods. A 2014 Stanford University studyconcluded that prohibiting the use of food stamps for sugary drinks would prevent 141,000 kids from becoming fat and save a quarter million adults from Type 2 diabetes. Restricting food stamp purchases for junk food (a popular bipartisan reform with the nation’s governors and mayors) would have far greater health benefits. The latest controversies around food stamps are a reminder that hysteria is a poor substitute for hard facts. There is no constitutional right to free junk food. America can aid the truly hungry without creating an illusory safety net that does more to spur obesity than to improve diets. We await Schumer's or Pelosi's denigration of the 6-year lows in food stamp recipients.